Persistence Market Research delivers yet another objective, comprehensive and insightful report titled ‘Rehabilitation Equipment Market: Global Industry Analysis (2012-2016) and Forecast (2017-2022)’. Through this report, the readers get a thorough briefing on the global rehabilitation equipment market and this report contains comprehensive discussions on the drivers, restraints and trends operating in this highly lucrative market. In addition, analysis of data over different parameters has been carried out in order to arrive at the on the dot and accurate market numbers concerning the global rehabilitation market. Besides, the competition landscape section of the report provides information on the level of competition in this highly competitive market and gives detailed information regarding the important companies operating in the global rehabilitation equipment market. The global rehabilitation equipment market is growing at a brisk pace all over the world. The reasons for this are the increasing number of disabilities that are derived from non-communicable diseases, favorable reforms in the healthcare sector and an increasing geriatric population coupled with increasing incidences of chronic diseases. In addition, increasing support from the government and technological innovations in the field of rehabilitation equipment which supports the geriatric population and the physically challenged people is also giving an impetus to this market. The favorable insurance and reimbursement policies in the healthcare sector of the countries in the developed world are also boosting the global rehabilitation equipment market. On the other hand, the high cost of the rehabilitation equipment along with a high maintenance cost of such equipment are the factors that are hampering the growth of the global rehabilitation equipment market to some extent. According to the assessment of Persistence Market Research, the global rehabilitation equipment market is forecasted to reach a figure of about US$ 13,400 Mn in 2022 and is poised to exhibit a robust CAGR in the period of assessment. 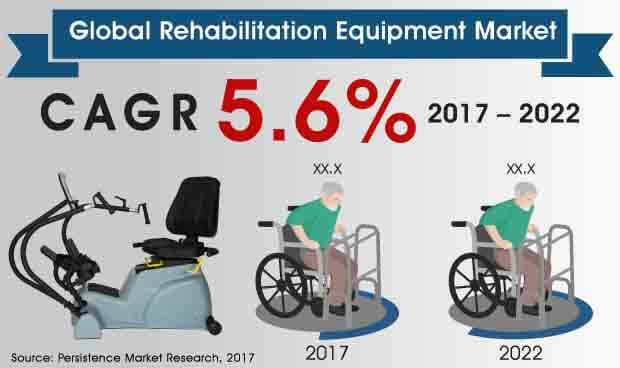 The market in Europe is set to dominate the global rehabilitation equipment market in terms of value and this trend is projected to sustain itself throughout the assessment period. Europe rehabilitation equipment market is the most attractive market, growing at a robust CAGR over the forecast period. According to the projections of Persistence Market Research, the daily living aids product type segment is expected to reach a value of about US$ 3,700 Mn in the year 2022. This signifies a moderate CAGR during the forecast period of 2017-2022. The daily living aids product type segment is estimated to account for more than one-fourth of the revenue share of the product type segment by the end of the year 2017 and is expected to lose in market share by 2022 over 2017. According to the assessment of Persistence Market Research, the hospitals and clinics end user segment is poised to touch a figure of about US$ 5,250 Mn in the year 2022. This signifies a CAGR of nearly 6% during the assessment period from 2017 till the year 2022. The hospitals and clinics end user segment is estimated to account for more than one-third of the revenue share of the end user segment by the end of the year 2017 and is projected to gain market share by 2022 over 2017. The report also profiles companies that are expected to remain active in the expansion of global rehabilitation equipment market through 2022, which include Invacare Corporation, Medline Industries, Inc., Dynatronics Corporation, Drive Devilbiss Healthcare, Roscoe Medical, Roma Medical Aids Ltd., Caremax Rehabilitation Equipment Co. Ltd and GF Health Products, Inc.